Extreme heat over the North China Plain is happening with increasing frequency in recent years, posing a substantial threat to human health and social activities. Thus, the mechanism behind the formation of extreme heat is of broad concern. A collaborative research team from China has published a new analysis that shows the horizontal heat flux in the mixed layer plays a crucial role in extreme heat events in the North China Plain region. Generally, large-scale anticyclonic circulation and descending flows lead to increases in air temperature. Previous studies have pointed out that extreme heat over the North China Plain is typically induced by the North China high. However, an extreme heat event that happened in the North China Plain region during 12-13 July 2015, with maximum temperatures exceeding 40°C at some stations, was characterized by only a weak simultaneous appearance of an anomalous anticyclone and descending flow, suggesting that some other factor(s) may have induced this heat event. 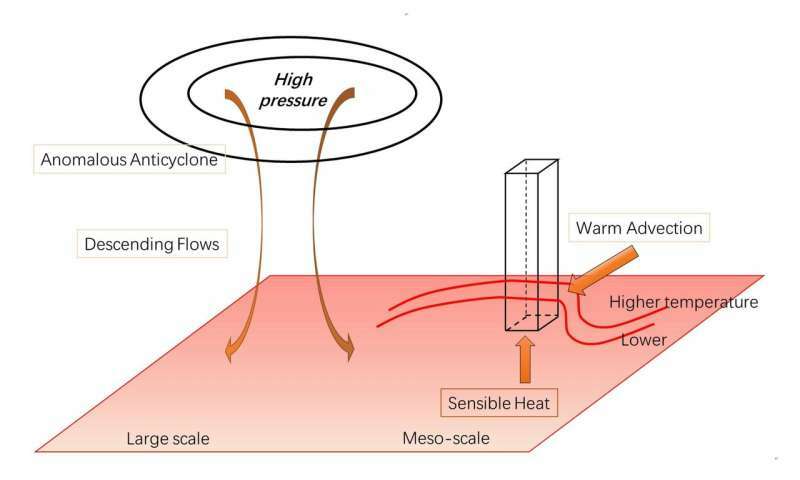 In the above context, Prof. Riyu Lu and his team from the Institute of Atmospheric Physics, Chinese Academy of Sciences, and their coauthors from the Institute of Urban Meteorology, China Meteorological Administration, decided to examine the role that mesoscale circulation systems might play in extreme heat events. Specifically, they analyzed the 2015 extreme high temperature event, employing the forecast data produced by the Beijing Rapid Updated Cycling operational forecast system, which predicted the heat event well, to investigate the formation mechanism of this extreme heat event. They calculated the cumulative heat in the mixed-layer air column of North China, which was composed of sensible heat flux from the ground surface and horizontal heat flux convergence, and the results indicated that the horizontal heat flux in the mixed layer played a crucial role in the temporal and spatial distribution of high temperatures. "Our investigations reveal that mesoscale circulation systems may also play a crucial role in extreme heat, which emphasizes the level of detail required when forecasting extreme high temperatures," concludes Prof. Lu.